Better to drink a wine a full year before its peak than a single day after it's turned. There are approximately 160 wineries in the Empire State, more than 100 of these in the Finger Lakes. Yet, the Finger Lakes produces about 90 percent of the state's wine. And, with more than 10,000 acres of vineyards, the Finger Lakes is the second largest wine-producing region in the country. These world-class wines fall mostly into the categories of Chardonnays, Reislings, Pinot Noirs, Cabernet Franc, and native varietals. 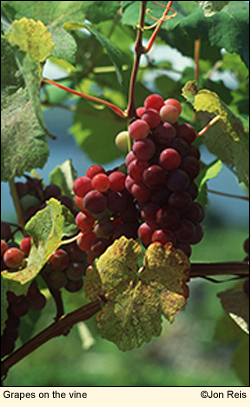 In addition, the Finger Lakes produces quality sparkling wines, ice wines, and fruit wines. In 1829 Reverend William Bostwick of Hammondsport decided to try growing grapes in the rectory garden, which he planned to turn into sacramental wine. Hammondsport seemed to be the starting point for a number of wineries during the 19th century, including Urbana Wine Company, which later became Gold Seal, and Great Western, the first American winery to win a gold medal in foreign competition. However, the first successful commercial winery in New York State was actually that of Samuel Warren of the Town of York in Livingston County, who produced his first vintage in 1832. By 1853, his York Wines was producing 3,400 gallons of wine a year. But it wasn't until Dr. Konstintin Frank, a viticulturist from Odessa, Ukraine, opened a winery just north of Hammondsport in 1962 that the region began to produce truly world-class wine. 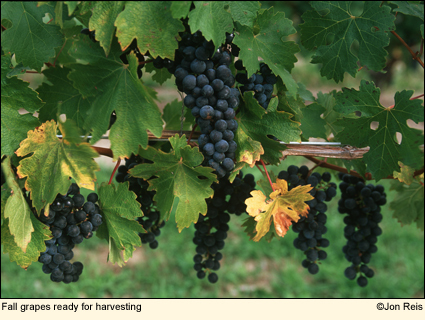 Dr. Frank imported varieties of the European grape species Vitis vinifera instead of the French hybrid varieties commonly grown in the region. These he grafted onto the hardy roots of native species. Since then, the number of wineries has continued to grow and spread throughout the region, making the Finger Lakes one of the this country's great wine-producing regions. The Finger Lakes is a federally recognized appellation. It has two federally recognized sub-regions--Seneca Lake and Cayuga Lake. Terroir is a French word. But terroir can not be translated easily. It is a collective concept rather than single entity. Terroir in the Finger Lakes encompasses the soil in which the grapes are grown; the surrounding vegetation, which contributes to the essence of the soil and the grapes; the hillside on which the soil dwells, how fertile it is, how well it drains, how it warms on a sunny day; the lake below the hillside and its particular climate; and, finally, the climate of the region. All these elements make up terroir, and any change in any one of these elements can affect--negatively or positively--the grapes grown at a particular vineyard. Consequently each vineyard, because of its particular terroir, has something unique to offer the wine connoisseur. Four Chimneys Organic Winery in Yates County is the only winery in the Finger Lakes to be certified as organic. It was also North America's first organic winery. Other wineries in the region may operate organically but are not certified. A number of wineries are taking steps to be more in tune with the environment. Heron Hill Winery, for example, has decreased the amount of pesticides it uses and installed 50 bluebird boxes and 2 bat roosts. In addition, Heron Hill is allowing wildlfowers around the vineyards to bloom and attract pollinators rather than mowing the plants down. Being eco-friendly, doesn't mean that the winery is sacrificing quality or taste. Look for and support these environmentally friendly wineries during your trip around the lakes. Many of the wines and beers in the Finger Lakes are made without animal products. For an up-to-date list, click here. The wineries in the Finger Lakes are mostly small, family owned operations. Putting their family names on the line, these wineries prefer to produce quality wines rather than wines of great quantity. For this reason, many of these wines are available for only a short time after production, mostly from the wineries themselves or from local retail stores. If you'd like to increase your appreciation and knowledge of wine, gain hands-on practice working vines and making wine, obtain an insider's view of the grape-growing and wine-making business, savor and evaluate wines during specially designed tastings, and enjoy field trips to some of the Finger Lakes' best vineyards, you may want to take Cornell University's adult education class Viticulture and Enology Experience (CUVEE).